Stay is an intense and moving book that is heavy on the metaphors and hidden meanings, but full of beautiful and heartbreaking emotion. Caletti alternates chapters between the present, when Clara and her father arrive at Bishop Rock, and the previous two tumultuous years that Clara was with Christian, covering the breathless beginning to the painful, bitter end. Caletti does such an excellent job at getting into Clara's head, exploring her emotions and feelings, revealing her entire personality to the reader, with occasional footnotes spread throughout the novel, which reveal both Clara's more serious and more sardonic sides. The setting of the book is wonderfully described and just so perfect—you'll wish you could just dive right into the pages of the book and directly into Bishop Rock. 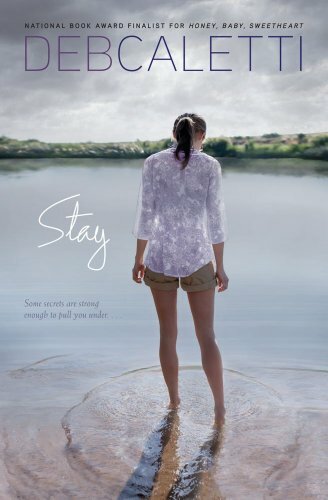 There's a lot of humor despite all of the pain in Stay, from Clara's father's insightful and witty ramblings, to the Bishop family's antics, all of which Caletti writes impeccably. Though on the surface the book may be about Clara moving on after an abusive relationship, the most gratifying aspect of Stay is Clara's relationship with her father and how it changes as both find true happiness at Bishop Rock and learn to finally confront Clara's mother's death. This thoughtful, vivid read will make you laugh, cry, and ache for Clara and all of the characters, and is one you won't likely forget anytime soon. Cover Comments: This cover is so pretty--I love the setting, the model's pose, the water, her clothes. But, I also like how it is a bit ominous with the grays and dark skies. Very symbolic! Stay will be released on April 5th, 2011! You mean I have to wait until April to read this? Sounds really good. I loved this book. Can't wait to purchase a finished copy! This book sounds excellent. I must read more Caletti. I just put this book on my Amazon wish list so I won't forget about it! Thanks for the review!!! I have read this article and it is really very nice & important article.This book sounds excellent. I must read more Caletti.That is one of the most incredible feelings on Earth.